Hand test pumps serve as pressure generators for the testing, adjustment and calibration of mechanical and electronic pressure measuring instruments through comparative measurements. These pressure tests can take place in the laboratory or workshop, or on site at the measuring point. If one connects the test item and a sufficiently accurate reference measuring instrument to the hand test pump, on actuating the pump, the same pressure will act on both measuring instruments. By comparison of the two measured values at any given pressure value, a check of the accuracy and/or adjustment of the pressure measuring instrument under test can be carried out. In order to approach the measuring points exactly, the hand test pump features a fine adjustment valve. The CPP7-H is a pneumatic hand test pump for low-pressure ranges up to 7 bar (101.5 psi), with switching to vacuum generation down to -800 mbar (-11.6 psi). The maximum pressure or vacuum achievable is dependent upon the connected test volume. Through the smooth pressure generation and the integrated fine adjustment valve, very small positive or negative pressures in the mbar range can be set safely and precisely. 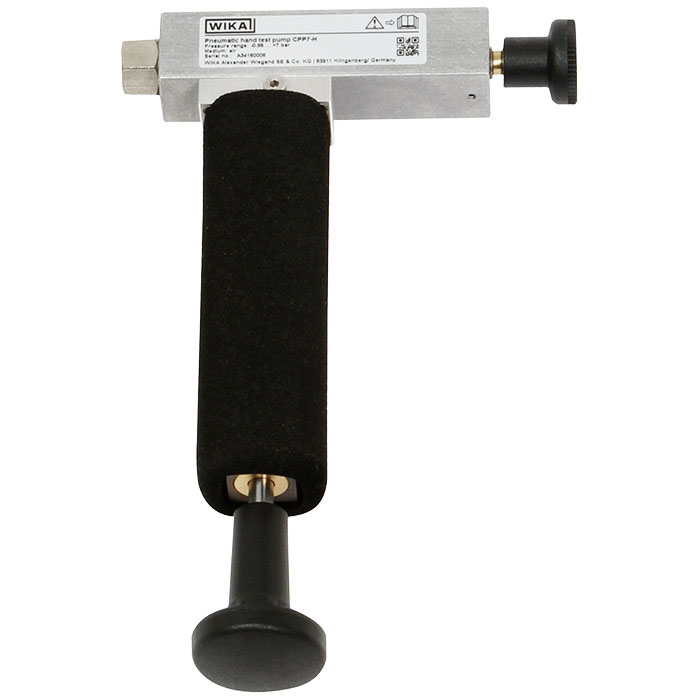 Via a T-connector with a hose connection, the test item and the reference measuring instrument can be easily connected.